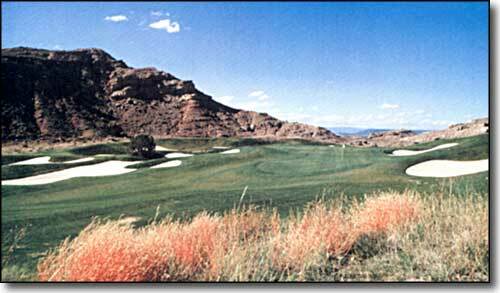 According to Golf Digest, Black Mesa Golf Club "could very well turn out to be the finest course, public or private, in the state." 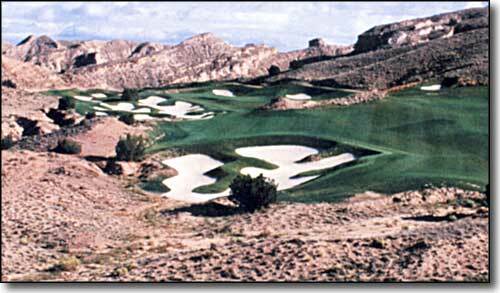 Designed by architect Baxter Spann, the course is located a half hour north of Santa Fe on the Santa Clara Pueblo. 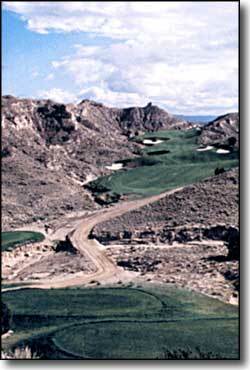 Black Mesa is visible from several locations along the course as the links wind their way through some pretty dramatic sandstone ridges. Each hole has its own memorable feature, and there is a wide variety of holes. Distinctive bunkering, the use of native arroyos as hazards and extensive green contouring in keeping with the scale of the natural landscaping are showcased throughout the site. The course also features a full service pro shop and grill, a very exciting short game practice area, a 60,000 square foot teeing area, two practice putting greens, and state of the art GPS carts. Reservations may be booked as far in advance as desired. Rates start at $25 for 18 holes. Most text and all photos are copyright © 2002 by Black Mesa Golf Club.